Everything you need for a healthy, dry, comfortable and energy efficient basement delivered right to your door. Measure and price your basement. We’ll guide you through the process – it’s fast and easy. 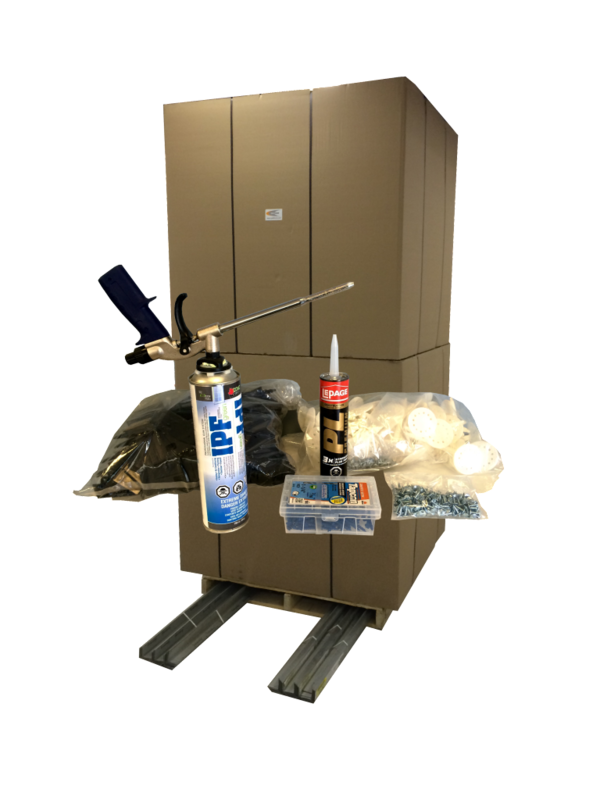 Fastest and easiest to install basement insulation on the market today. Read what BIS customers are saying. Just a quick note to thank you for the great service and your amazing insulation system. When I did my research for the most cost effective and efficient method to insulate the basement of the house I just purchased I am so blessed to have crossed your path. The product you offered did exactly what I wanted and needed. It provided me with double the R factor for efficiency and also eliminated the need for any framing which saved me money and most important time. Government approved testing. Supported by building scientists. Air, vapour, radon & radiant barrier, insulation & framing….All in one. 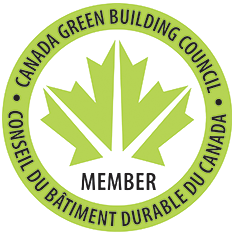 Tested by certified laboratories approved by the Canadian National Research Council. Supported by leading building scientists. Eligible for government energy savings programs. Approved for the Manitoba Hydro Power Smart Program. Environmentally responsible. No off gassing, No formaldehyde, Non Toxic. 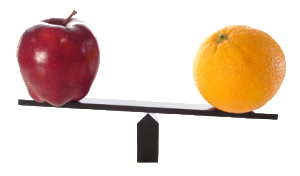 When energy savings are considered, the cost of quality insulation and air sealing is really an investment. 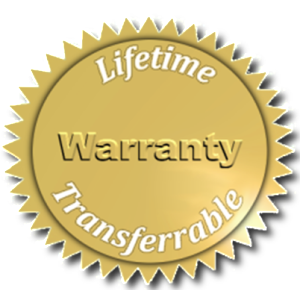 We’re so confident in your satisfaction we offer a Lifetime Transferable Warranty. Please enter the height and length of each wall in your basement that you plan on insulating. Quik-Therm insulation panel size: 4' x 4' (16 sq. ft.) x 2.75" thick. *If your walls are higher than 10 feet please call 1-855-909-9247 for a quote. Please fill out your name and email below and we'll send you this estimate for your records. Everything you need delivered right to your door. 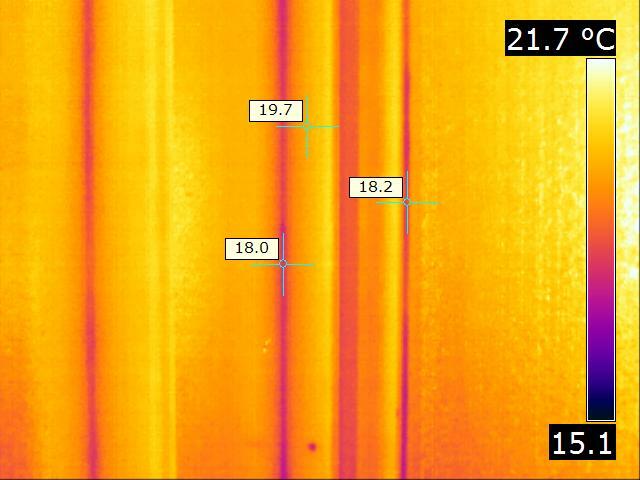 Infrared cameras detect temperature variations in walls. Dark inconsistent colors indicate moisture, air leakage, thermal bridging and energy loss. Light uniform colors indicate a comfortable and healthy living environment and low energy bills. Spot temperature indicates the temperature of a specific area. Increased Climate Comfort – Increase the comfort of your basement by up to 7 degrees. Never Worry About Mold Or Mildew Again – BIS does NOT absorb water and will not promote mold/mildew. 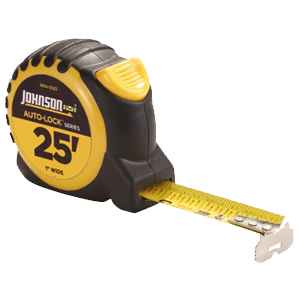 Save Installation Time – Lightweight, quick & easy to install. Installs in about half the time of regular batt and studs. No Thermal Bridging – Continuous foam insulation panels and stud design STOPS heat loss through framing members. Environmentally responsible – contains recycled Expanded Polystyrene. Does not off gas or contain formaldehyde or VOC’s. Unlimited Phone Support – If you have a question, give us a call. We’re here to help you. Call 1-855-909-9247. 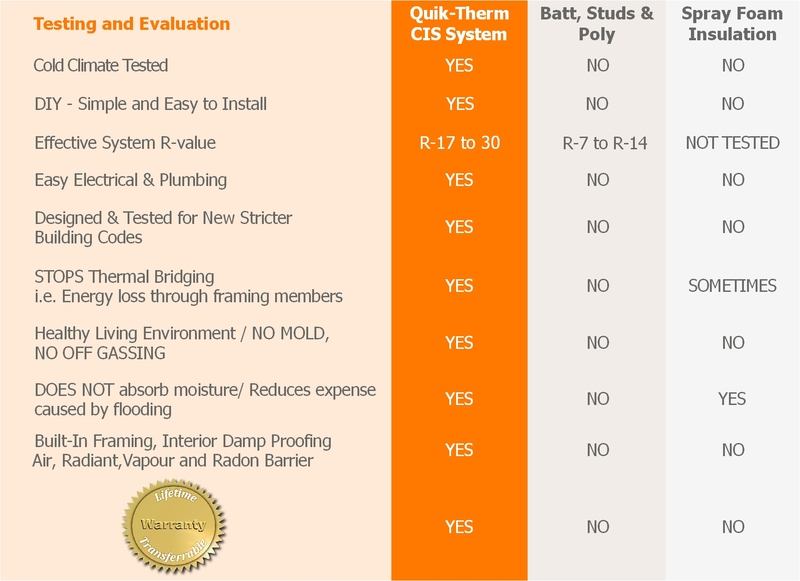 Compare Quik-Therm BIS to other basement insulation systems. 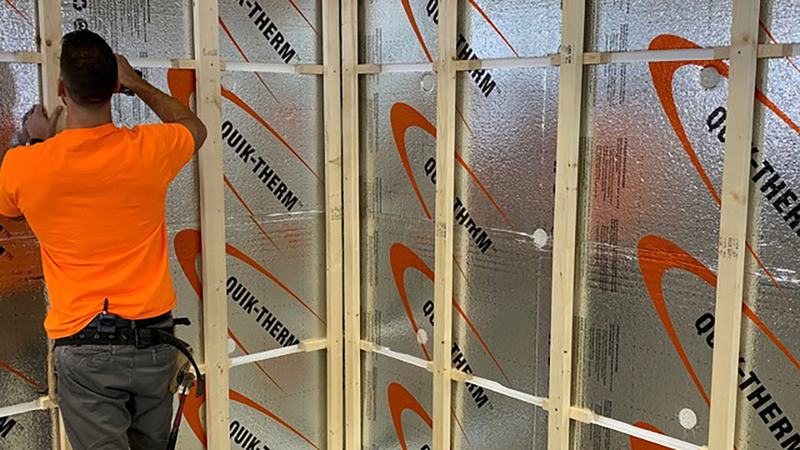 Quik-Therm insulation technologies take advantage of what is readily available and explores what is practically achievable. Sustainable building materials must be cost effective, provide superior thermal performance and health benefits. They must be non toxic, require minimal energy, minimal waste and pollution during the manufacturing and transportation process and contain pre or post recycled building materials. My son in law & I (both Do It Yourselfer’s), together with the guidance from Ryan from Quik-Therm transformed a 1200 sq. ft. basement space from a cold, damp & mould infested area to a warm, dry & clean space using Quik-Therm insulation on the interior basement walls. The preparation was the toughest. The poly, mouldy fiberglass & wood stud framing were removed & the concrete walls washed to remediate all the mould. Time cosuming but necessary to give us a clean starting point. This was the easy part. The polymer laminated 4′ x 8′ tongue & groove insulation panels were light, joined together easily & attached to the concrete walls quickly. When necessary, cutting the panels to size was a breeze. Canned spray foam was used to seal the sill plates & panel joints providing a complete vapour barrier. No hazardous materials nor itchy fiberglass to handle. Levelling the metal stud walls was effortless using the joist & floor metal plates. The vertical metal studs attached to insulation panels using clips & self tapping screws. The roughed in wall system accomodates electrical installation. After the drywall was attached to the metal studs the wall felt strong & rigid. The Quik-Therm panels are slightly more expensive than fiberglass, however the installation savings would be greater than the product cost differential. As well , Quik-Therm insulation value exceeds codes, is Government approved & qualifies for Manitoba Hydro Energy Savings Program. We expect to realize some energy cost savings. their product. I would recommend! product. In the last couple months, we have noticed a huge difference in the temperature of the basement. 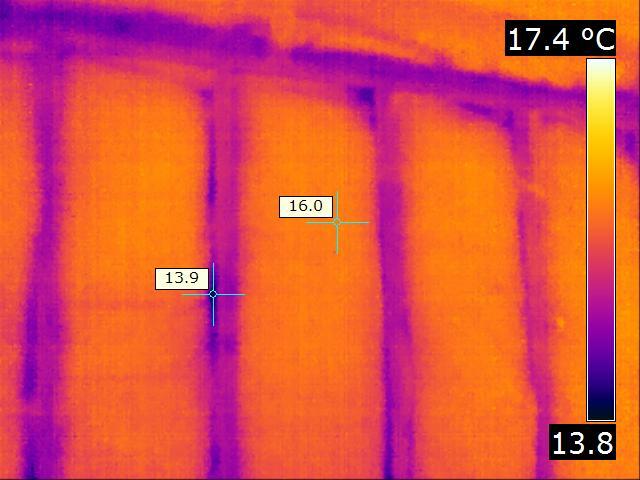 After the insulation was installed, we saw an immediate increase in the temperature of the basement by 4 degrees. The install process was quick and left little mess. We have since finished the basement and found your product simple to work with for installing both electrical wiring and drywall. “We recently constructed a new energy efficient home and utilized Quik-Therm in the walls, ceiling and basement. We were impressed at how durable, fast and easy all Quik-Therm products were to install. The 2″ Quik-Therm Concrete Insulation was installed in the basement. Our contractor said it was a pleasure to work with; no itchy fiberglass, poly or sealants. He claimed he was able to install Quik-Therm in about half the time of fiberglass and wood studs and would relish the opportunity to work with it again.